"Fly" is a song by American rock band Sugar Ray. It appears on their 1997 album Floored twice: one version with reggae artist Super Cat (track four) and the other without (track 13). The song became the band's first hit, holding the No. 1 spot on the Billboard Hot 100 Airplay chart for four consecutive weeks and spending eight weeks at the No. 1 spot on the Hot Modern Rock Tracks chart. A physical CD-single was not released commercially in the US, although it was a huge hit on American radio. The song also reached No. 1 on Canada's Singles Chart. "Fly" did not sound anything at all like the rest of the tracks on the album, being the only reggae fusion track. It also quoted a line from Gilbert O'Sullivan's 1972 hit "Alone Again (Naturally)." 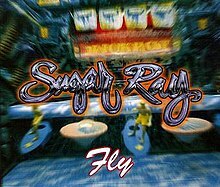 Sugar Ray's lead singer Mark McGrath explained that this song had a bouncy beat, yet it was about death; "Fly" too seemed like a bright, up-tempo song but "there is this stark imagery in there. There's loss in it. There is loss of a mother, obviously. I thought it was a good way to juxtapose the lyrics with the melody on that, similar to what Gilbert O'Sullivan did on "Alone Again (Naturally)." As a result of the success of "Fly", Floored sold extremely well and was certified double platinum. However, by the end of 1997, critics skeptical that Sugar Ray could put out another successful song labeled them a one-hit wonder. This assumption was noted and accepted by the band, who in playful defiance, named their next album 14:59 in a reference to Andy Warhol's "15 minutes of fame"; that album became certified triple-platinum and outsold its predecessor. The song was included on VH1's countdown of the "100 Greatest Songs of the '90s" at number 52. "Fly" incorporates elements of dancehall. A cover version was recorded by the band Pinmonkey on their 2002 self-titled album. Four Year Strong also covered the song on their 1990s cover album, Explains It All, featuring Travie McCoy from the band Gym Class Heroes. ^ Richin, Leslie (January 12, 2017). "20 Alternative Rock Hits Turning 20 in 2017". Billboard. Retrieved November 29, 2018. ^ BOEHM, MIKE (June 25, 1997). "Rip-Off Artist Hopes to 'Fly' : SUGAR RAY "Floored" Lava/Atlantic (**)". Los Angeles Times. ISSN 0458-3035. Retrieved November 15, 2018. ^ "Please Enjoy This Sugar Ray Cover of Brian Eno and John Cale’s “Spinning Away”". Spin. Retrieved November 15, 2018. ^ "Did 1997 contain the worst two weeks in music history?". music.avclub.com. Retrieved November 15, 2018. ^ "Top Singles - Volume 66, No. 6, October 13, 1997". RPM. Retrieved 2010-06-21. ^ "VH1's 100 Greatest Songs Of The '90s: Not Enough Pavement". Stereogum. Retrieved 2016-12-11. ^ "CNN - Sugar Ray flying high with new hit - September 9, 1997". edition.cnn.com. Retrieved 2018-11-02. ^ "Australian-charts.com – Sugar Ray – Fly". ARIA Top 50 Singles. ^ "Dutchcharts.nl – Sugar Ray – Fly" (in Dutch). Single Top 100. ^ "Sugar Ray: Artist Chart History". Official Charts Company. Retrieved December 15, 2018. ^ "Sugar Ray Chart History (Adult Pop Songs)". Billboard. Retrieved December 15, 2018. ^ "Sugar Ray Chart History (Alternative Songs)". Billboard. Retrieved December 15, 2018. ^ "Sugar Ray Chart History (Mainstream Rock)". Billboard. Retrieved December 15, 2018. ^ "Sugar Ray Chart History (Pop Songs)". Billboard. Retrieved December 15, 2018. ^ "RPM '97 Year End Top 100 Hit Tracks". RPM. Library and Archives Canada. Retrieved March 23, 2019. "Mr. Bartender (It's So Easy)"